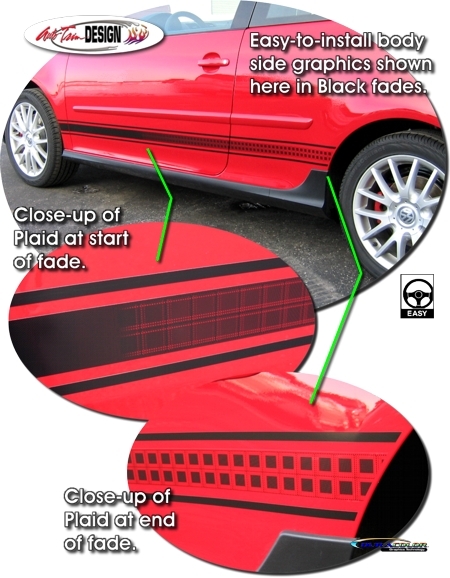 Set your '06-Current Volkswagen GTI apart from the rest with this classic body side graphic set. Available in our unique Plaid fade (simulates the Plaid used on the interior) or solid colors and is packaged with one (1) left and one (1) right side graphic. Trimming required at door jambs and at each wheelwell. Installed approximately 0.5" (12.7mm) above bottom body line as shown, this graphic will fit two (2) door and four (4) door GTI's. While graphic kit is shown on a GTI, it may fit other vehicles. Please measure your vehicle prior to ordering. Please Note: Due to the manufacturing technology used for each type of graphic, the Plaid Fades graphic set is available in four (4) fade colors while the Solid kit can be ordered in a wide variety of DuraCUT colors.